Payson Sheets, an archeologist from the University of Colorado had a National Science Foundation grant to excavate prehistoric villages in Costa Rica. Devastated by ten volcanic eruptions over the past 4000 years, these villages were preserved to some extent under layers of ash. This was one of the most extensive remote sensing databases created for archeology to that time. 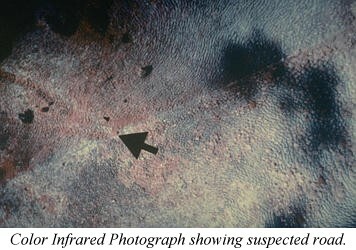 Linear features were detected in the color infrared photographs. First thought to be roadways, they seemed to be several feet wide at the surface, upon excavation, they turned out to be footpaths, the oldest known footpaths. Using excavation and dating techniques, it was determined that there were two time periods for the footpaths. The earliest dated to 500 BC (2500 years ago). The faint lines indicating footpaths on the infrared photographs could only be seen in open pasture lands. Later, TIMS was used to discern the footpaths beneath the thick forest canopy. The footpaths can be seen as a window into the culture's religious, economic, political and social organization. As people travel along paths, for a variety of objectives including transportation, communication, and ritual, they leave behind them the record of their presence. This is an aspect of behavioral archeology, the study of prehistoric features to understand networks of human activity and their underlying reasons for those activities. Excavation of a remotely sensed footpath. Tom Sever & Payson Sheets on a prehistoric footpath. Jungle canopy under which the prehistoric footpaths are located. A wandering people lived around Arenal as early as 10,000 BC, finally settling permanently on the nearby lakeshore around 2000 BC The people raised corn and beans and got the rest of their diet from wild crops. The population never grew large enough to require extensive agriculture. This allowed them to survive the eruptions of the Arenal volcano. After an eruption, the people would move 15 or so miles away, and return once crops began to grow again. This resiliency was probably a direct result of the Arenal people's simplicity; a small society in balance with the tropical ecology could bounce back more easily than could a civilization as complex as the Maya. In the end it was likely an epidemic, not an eruption, that doomed the people of Arenal at about the time of the conquistadors. "Remote Sensing in the Arenal Region," In Archaeology, Volcanism, and Remote Sensing in the Arenal Region, Costa Rica, edited by P. Sheets and B. McKee. University of Texas Press, Austin, 1994. "Prehistoric Footpaths in Costa Rica: Remote Sensing and Field Verification," with P. Sheets and B. McKee. In Archaeology, Volcanism, and Remote Sensing in the Arenal Region, Costa Rica, edited by P. Sheets and B. McKee. University of Texas Press, Austin, 1994. "Prehistory and Volcanism in the Arenal Area, Costa Rica," with P. Sheets et al. In Journal of Field Archaeology, Volume 18: Number 4, Winter 1991. "Prehistoric Footpaths in Costa Rica: Transportation and Communication in a Tropical Rainforest," with P. Sheets. In C. Trombold's Ancient Road Networks and Settlement Hierarchies in the New World. Cambridge University Press, Cambridge, 1991. "High Tech Wizardry," In Archaeology, November/December 1988. "Airborne Archeology," World Book Encyclopedia Science Yearbook, 1987.